Education in Ukraine is marked by integrity violations from early childhood education and care through postgraduate study. In the past decade policy makers and civic organisations have made progress in addressing these challenges. However, much remains to be done. 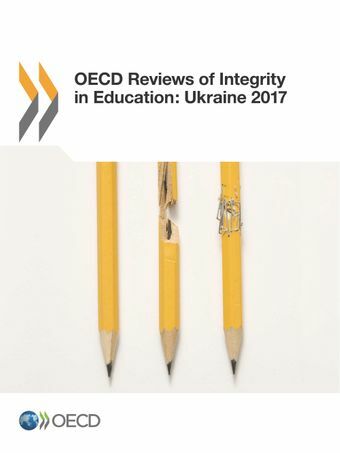 OECD Reviews of Integrity in Education: Ukraine2017 aims to support these efforts.The review examines systemic integrity violations in Ukraine. These include: preferential access to school and pre-school education through favours and bribes; misappropriation of parental contributions to schools; undue recognition of learning achievement in schools; paid supplementary tutoring by classroom teachers; textbook procurement fraud; and, in higher education, corrupt access, academic dishonesty, and unwarranted recognition of academic work.The report identifies how policy shortcomings create incentives for misconduct and provide opportunities for educators and students to act on these incentives. It presents recommendations to address these weaknesses and strengthen public trust in a merit-based education system. The audience of this report is policy makers, opinion leaders and educators in Ukraine.